Prior to last week, you cannot book Korean Air awards online. So even though it is an Ultimate Rewards transfer partner, I never consider transferring any points to them. The reason? They are a pain to deal with! Not only you have to call in, you also have to fax in documentation to prove your relationship to your immediate families. Seriously, right?! But that has changed as of last week. 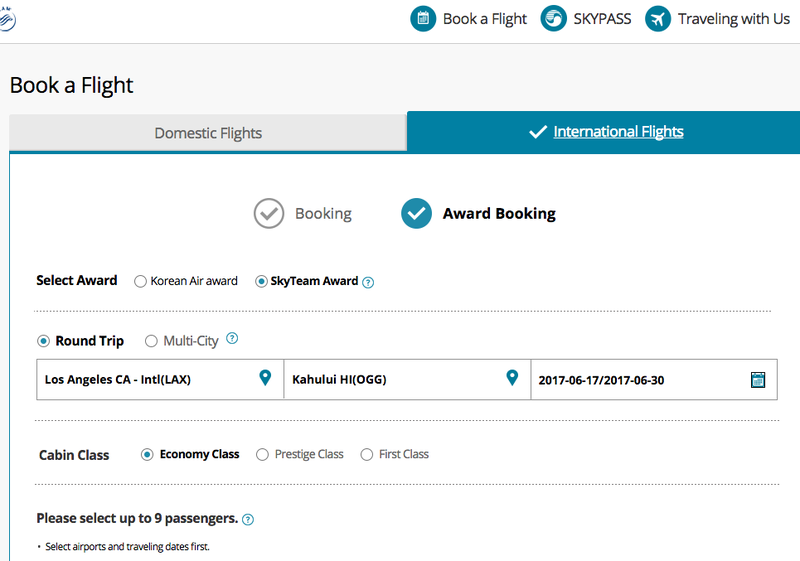 Follow these steps to book Korean Air awards online – You can now book many SkyTeam alliance awards online with Korean Air! Round-trip flights within North America cost 25,000 points in coach and 45,000 points in business. North America includes Hawaii and Mexico! The only SkyTeam member in the U.S. is Delta. This means, you can now book Korean Air awards online and use the Korean Air miles to fly Delta to Hawaii and Mexico for 12,500 one-way in coach, flights that would normally cost 22,500 Delta miles to Hawaii or 17,500 miles to Mexico at the cheapest award level. Once I found the flights I want on Delta website, I was ready to book Korean Air awards online by logging into Korean Air website and put in the dates I wanted. And available flights show up on the next page. After I clicked the flights and hit the “calculate” button, it confirmed the required miles at 25,000!!! At this point, I was not able to go any further as I had no miles in my SkyPass account. 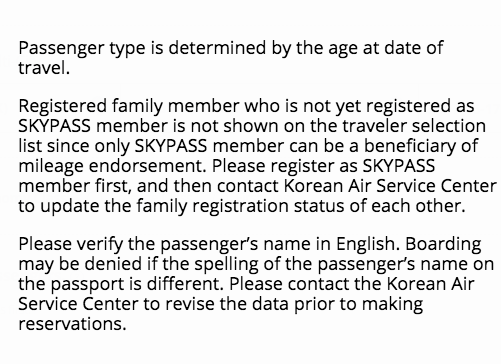 Also, I was not able to book Korean Air awards online for anyone else as I didn’t register any members of my family. In order to book for them, their names must show up in the passenger list. I guess the documentation process is unavoidable if I want to take advantage of this sweet redemption! I searched for Mexico and it also returned for 25,000 miles roundtrip! Sign up for a SkyPass account. Alternatively, you can fax the Family Registration Form along with documentations to 310-417-5696 (U.S. and Canada). Have you booked Korean Air awards online? If so, how was your experience? How do you book the award if you’re departing from a location that Korean doesn’t serve but Delta does? I live in Denver and it’s not a departure option on the Korean site. Thanks and I look forward to taking advantage of this option if I can. How do I know what the Saver Level is? I’ve seen conflicting numbers from 45K to 60K when attempting this Delta/Korean to Hawaii. I’m looking at May 2018 from MCI. Has anyone booked a Hawaiin trip this way? How easy is it? Before I transfer points to Korean airlines, I’m wondering if this is easy to navigate. I need to book 5 R/T flights to Hawaii from Portland, ME in December, over the Christmas holiday. I can book with Singapore (using United) for 35K R/T. It’s more miles but seems easier to book, however, if I can save 50K points, I’d love to do that! You want to make sure Delta has saver award seats available before you transfer any points (check Delta website). And then go on KE site to see if you can find the same flights. You also need to send in documentations for family members so that you can redeem miles for them when you are ready. It can take a few days for the points to show up in Korean. Could I lose the 5 seats while waiting for the points to transfer (from UR, SPG) to Korean?